When it's not ridiculously hot, it's hard to beat a long summer's day for life's simple indulgences. I love that it can still be bright at 8 o' clock in the evening. 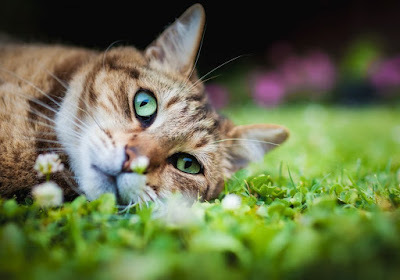 I love enjoying my dinner in the open air, as the residual warmth from the last rays of the sunlight and the emerging coolness of the evening breeze caress me. If you're in Melbourne, you know we're currently experiencing a ridiculously hot week. Fortunately, it was under much more comfortable conditions when I ticked Rockwell and Sons (288 Smith St, Collingwood) off my wishlist last month. It was one of those gorgeous days, if I do recall correctly. And for a pretty evening like that, you've got to start with a pretty drink. 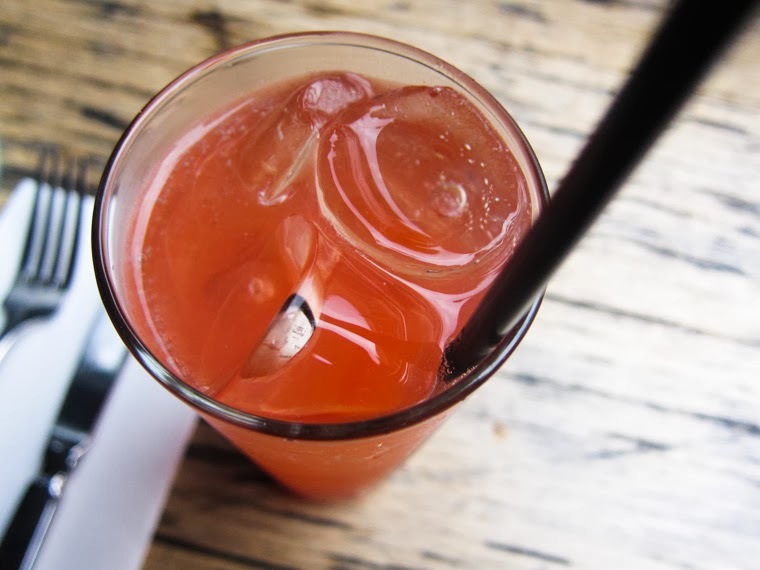 I made the right choice with a strawberry and star anise soda - a lovely housemade affair with fresh, true flavours, sweet with strawberries and flickering with the faintest hint of star anise. Strawberry and Star Anise Housemade Soda ($5). 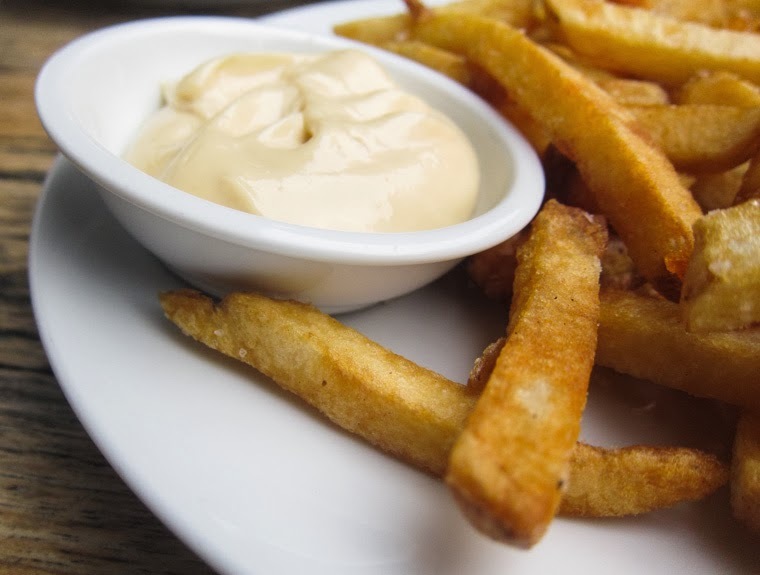 French fries with malt vinegar aioli, an excellent combination. The pairing of the crunchy fries with the quite strongly acidic aioli reminded me of salt-and-vinegar chips! French Fries, Malt Vinegar Aioli ($6). I had heard so much about the burgers at Rockwell and Sons, especially the famous Double Patty Smash Burger. Perhaps too much, as all the rave reviews had me thinking that this could be a life-changing burger, which is probably quite unrealistic. 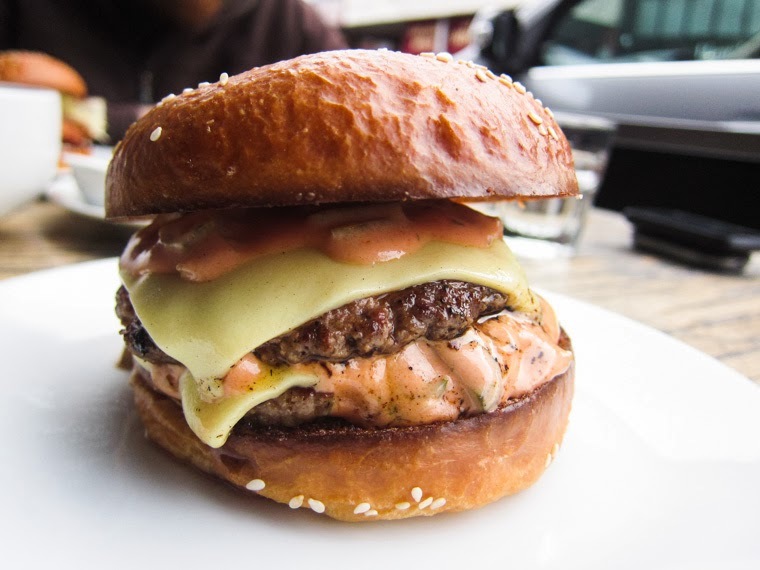 So look, it may be over-hyped but it was still enjoyable, to be fair - juicy patties, soft and buttery brioche bun, a tasty sauce reminiscent of thousand island dressing... and, I really, really like how there were pickles in every bite, because pickles are awesome. Double Patty Smash Burger ($10). 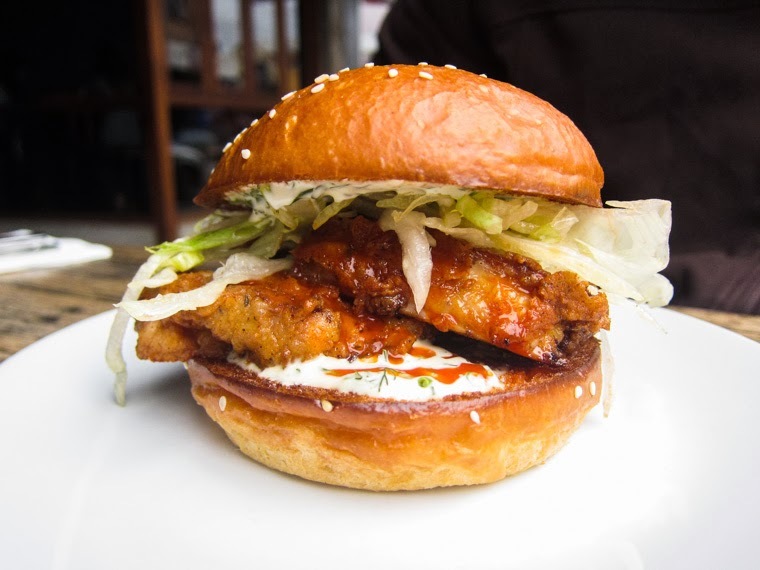 The fried chicken sandwich with buttermilk dressing, iceberg lettuce and hot sauce was delicious, too. We gobbled it up in no time. You know what? These burgers are kind of like what would happen if McDonald's was given a quality, classy, gourmet makeover. I say that as a compliment. 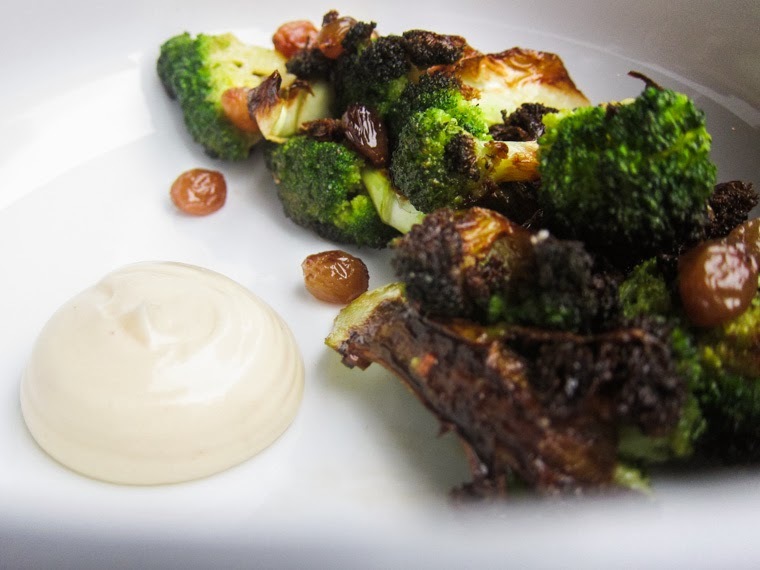 The surprise of the night was the pan-roasted broccoli with bonito aioli and pickled sultanas. What a great way to cook broccoli! It was caramelised, it was smoky, it was quite a revelation. The waiter, sensing my delight, said this dish, too, was a favourite of his - that he thought it was a stroke of genius and wanted to try it at home. Yeah, I'm definitely going to pan-roast my broccoli and pickle my sultanas in the future. Thanks for the idea, Rockwell and Sons! Pan-Roasted Broccoli, Bonito, Pickled Sultanas ($12). Malt vinegar aioli is an inspired idea! This meal looks fabulous, and if it helped you avoid melting in the heat, that is a good thing! I've never thought of adding sultanas to broccoli, but that dish does sound inspired. Might have to pick up a few and start pickling! Mmm, love all the aiolis! And that soda sounds divine. They do seem to like their aiolis there! And the soda was indeed lovely. Wow, that all looks great and sounds even better (although you can keep the pickles and sultanas)! Haha yeah I should get on to it! wow that drink looks so pretty! soudns delightful too. i love your opening para - that is summer to me, too, eating dinner outside in the remains of the day. sadly we don't get to enjoy that too often here in hobart. i hope you survive this week's heat. It tastes pretty, too! :) And I am glad to say that I have survived that heat! Those burgers look damn good man, really have to visit soon! ohhh i'll be checking out Rockwell soon.. ur review makes it quite drool-worthy.. can't wait!